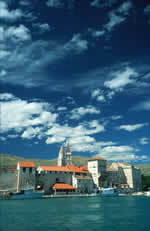 Mario apartments are located in a small Dalmatian place Mastrinka-Arbanija near to the historic town of Trogir (2,5 kilometers), whose old town included in the UNESCO list of monuments of world cultural heritage. The apartments are situated in a beautifully furnished family home (new building), and the house is only 150m from the nearest beaches with many facilities for sport and recreation and a large parking area. 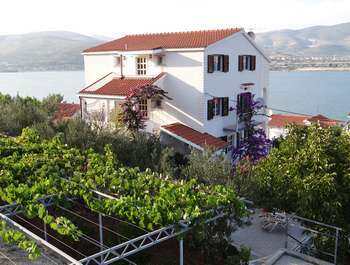 From the apartments guests have a beautiful view of the Trogir’s Bay and good looking on the nature (pine wood, sage, rosemary and other Mediterranean plants). Our apartments are ideal for guests who want to enjoy the real Dalmatian atmosphere, the peace and quiet, away from traffic noise. Here, guests can swim and spend the whole day enjoying the clear blue sea and the many contents that are offered on the beach (a children's playground, restaurant and cafe, showers, umbrellas ..). Here are some useful links for your informations.